We want to remind the community that all sea turtles are still protected, and that both State and Federal consequences apply to anyone harming a green sea turtle. Sea turtles across the planet face threats including, but not limited to, illegal harvest, destruction and alteration of nesting and feeding areas, incidental capture in commercial and recreational fisheries, entanglement in and ingestion of marine debris, disease, vessel strikes, and climate change. 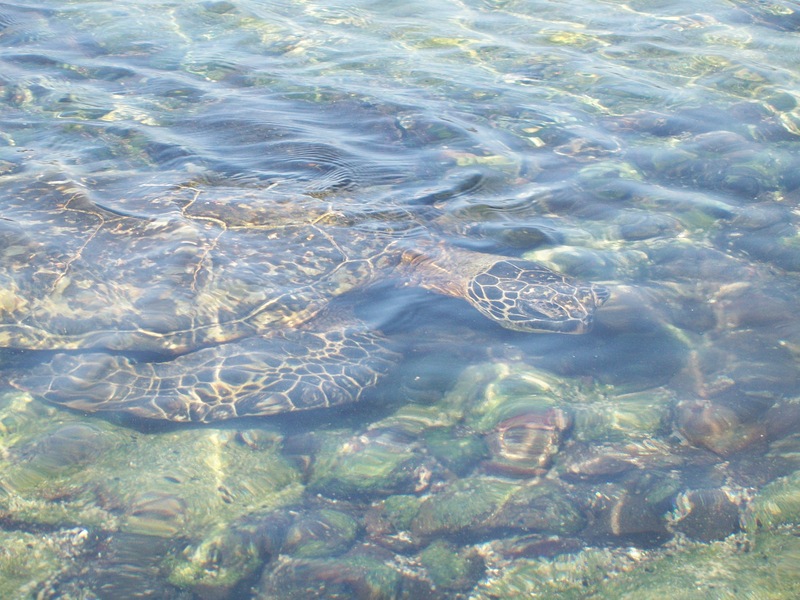 The two types of sea turtles most frequently observed in Hawaii nearshore waters are the green and hawksbill sea turtle. 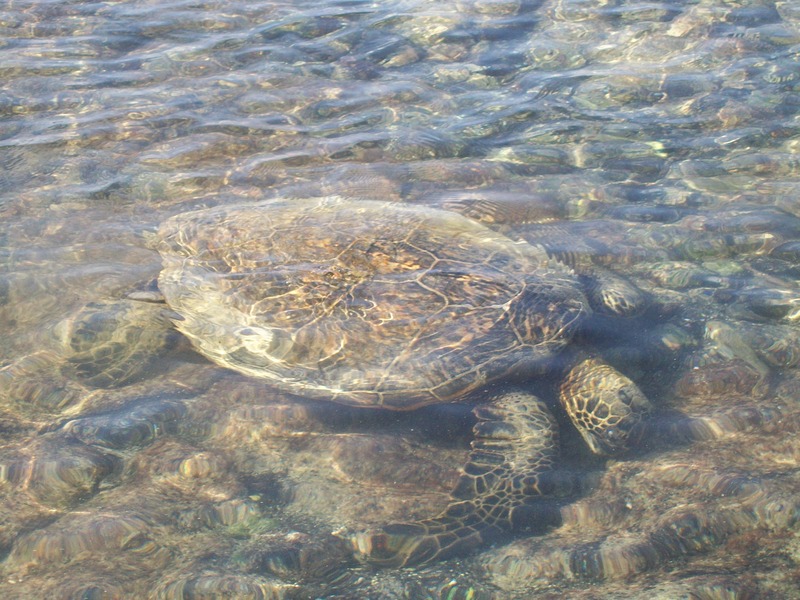 The green sea turtle (Chelonia mydas) is listed as threatened and the hawksbill sea turtle (Eretmochelys imbricata) is listed as endangered under the Endangered Species Act (ESA). The public is urged to act responsibly and not attempt to touch, disturb, feed, pursue, ride, harass, harm, or otherwise injure these animals. Not so very long ago people had a very different relationship with animals than they do now. There was much more familiarity between the humans and all the other species. Not just the domestic rabbits and goats but also the animals of the air and land and sea. Not so very long ago people would gather with their children and tell stories of the animals with which they shared the world. They taught respect. This is the story of Kauila from the Big Island of Hawaii. 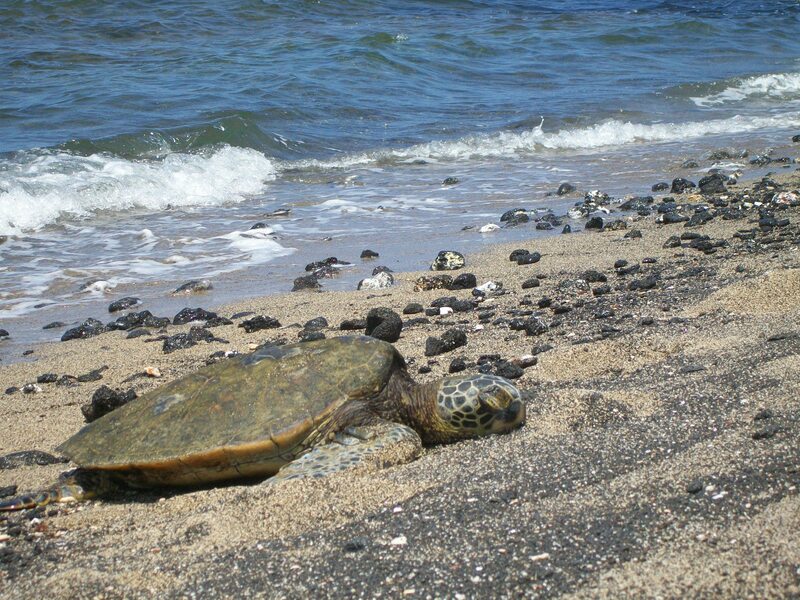 The mystical sea turtle Kauila was born on the black sandy shores of Punalu’u, in the district of Ka’u on the Big Island of Hawaii. 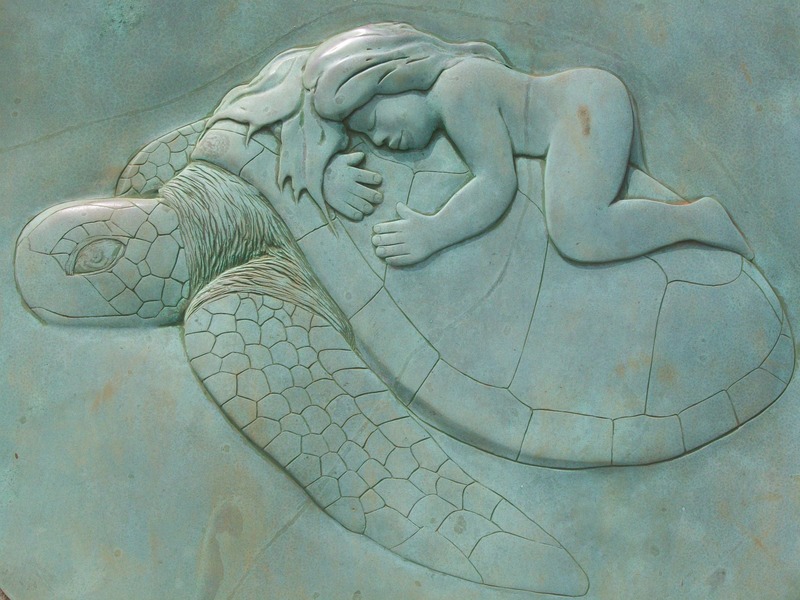 Her mother and father were Honupo’okea and Honu’ea. Honupo’okea gave birth to a very special egg with the color and shape similar to a piece of kauila wood. She buried her egg in the black sand to be warmed by the Hawaiian sun until it was ready to hatch. 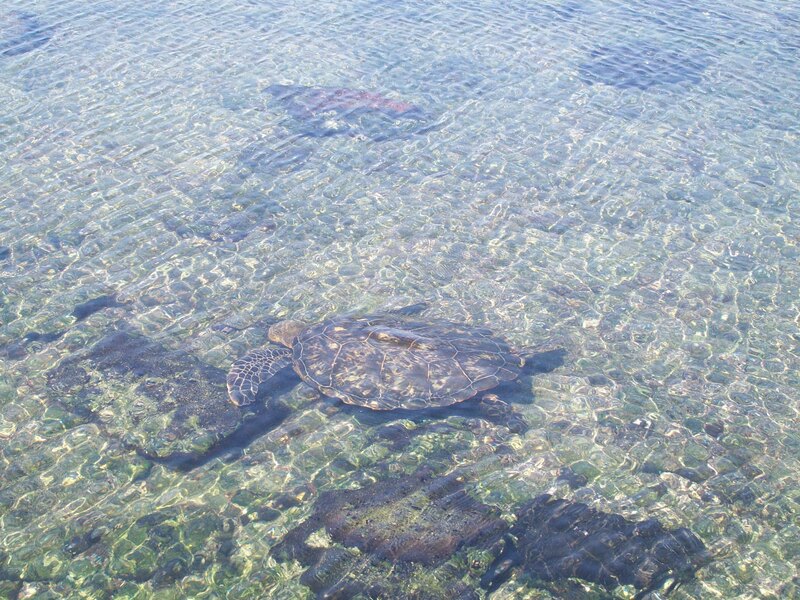 Before returning to the sea, Honupo’okea and Honu’ea used their flippers to dig deep into the earth forming a fresh water pond near their precious nest. When the egg hatched a beautiful baby turtle emerged. She was dark and glossy, like kauila wood. Mother and daughter lived at the fresh water pond until Kauila was old enough to be on her own. Punalu’u became Kauila’s home. The bottom of the fresh water pond was her resting place where the air bubbles from her breath would rise to the top of the pond delighting the children of Ka’u. Kauila loved the children so much that she would sometime change herself into a little girl to keep watch over them and play with them on the black sandy shores. The people of Ka’ū loved Kauila as the guardian of their children and also for her spring that gave them pure drinking water. Story as reported by historian Mary Kawena Pukui. This entry was posted in environment, Nature, water and tagged children, environment, Hawaii, photography, water. Bookmark the permalink. Gina, thank you for the encouraging words. What a wonderful story: thanks for sharing! Sea turtles are my favorite! Enjoyed this post and getting to know the Hawaiian story. Thanks for sharing. 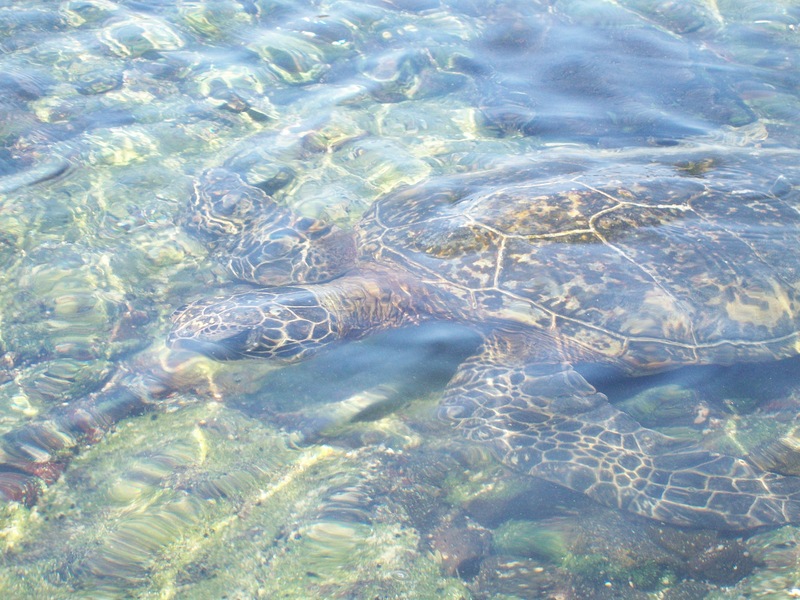 Many thanks for posting… I so, so miss our sea turtles from the South Pacific. Amazing, beautiful animals. They’re such an integral part to many cultures — the art, culture, creation stories. I’m always praying for their protection and continued survival, even here, in South Florida, as they struggle against development. Thanks again.